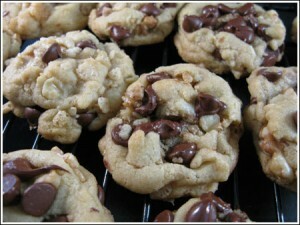 Chocolate Chip Cookies Made With Oil -- You won't miss the butter! Or maybe you will, but these are good in their own way and worth a try. 1 1/2 cups (185 grams) all-purpose flour -- fluff up before scooping and sweep carefully or weigh out 6.7 oz. Stir together flour, soda and salt. Set aside. Whisk together both types of sugar, oil, egg and vanilla. Add flour mixture to oil mixture and stir just until blended. Stir in chocolate chips and walnuts. Using a tablespoon measure, scoop up dough and shape into tight rounds of about ¾ to 1 inch. Space them about 2 inches apart on two ungreased cookie sheets. The mounds should be bursting with chips(note: if the dough balls seem really dry, press them down a little bit). Bake for 8-10 minutes. Cool for 2 minutes on cookie sheet, then transfer to a wire rack to continue cooling.